Every year, on the first Saturday in May, comic book creators and publishers collaborate with comic book stores around the world to give out free books to once and future fans. It's not too late to participate. Well, not to late for anyone not scheduled to work until after his local comic book store is closed. I'm forced to forego the festivities this year, so I won't get to stand in line for an hour and change to find out every copy of the Rocket Raccoon book is already gone. Pity! For those of you unfamiliar with the most jolly of holidays, here's an official explainer video. Want to participate, so I can do so vicariously through you? 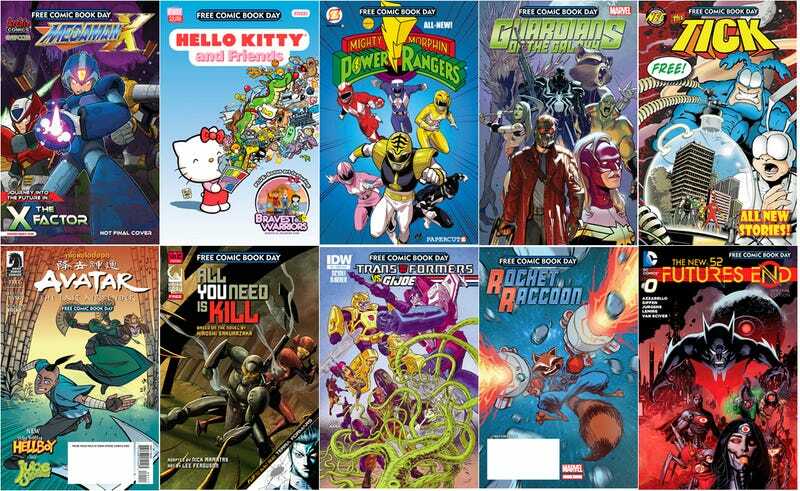 First, hit up the store locator to see if a location near you is celebrating Free Comic Book Day. If your store is participating, it might be worth giving them a call to ask what their policy is — some require a purchase for more than one free book, some have a limit on the number you can get, and just about all of them will be happy to take the time to talk to you slowly over the phone on the busiest day of the year. Then check out this year's crop of free comics. Let's see, The Tick, Hello Kitty and Rocket Raccoon - it's as if they planned it around my bed sheets. Finally, get in your car and go. Or take public transportation. Or ask your mother to take you there. Just go there. It'll be a blast, and you'll get free things.